Root vegetables are great because they last a long time and they all taste so good together. Try mixing root vegetables you know that you like with new varieties you want to try! Optional seasonings: ​Homemade Italian seasoning, fresh rosemary, parsley, or thyme. Don't have fresh herbs? Check out this blog to learn how to use dried varieties instead. Cut lemon in half and squeeze the juice into a large bowl. Discard seeds. Add vegetables, water, oil, Italian seasoning, salt, and pepper to the bowl. If using other herbs, add those as well. Toss to combine. Transfer vegetables to a pan. Leaving the leftover marinade in the bowl. Place pan with veggies in oven. Bake for 10 minutes. 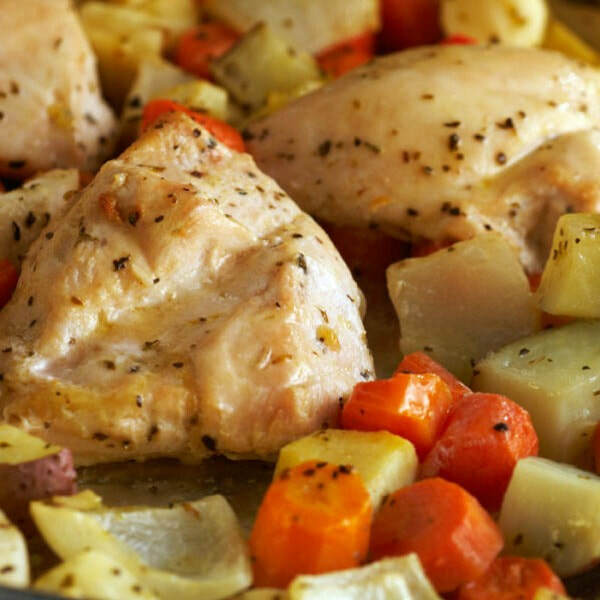 While veggies bake, toss chicken in the remaining marinade. Let sit at room temperature for about 10 minutes. Remove pan from oven. Add chicken pieces on top of veggies. Return to oven. *Nutrition information includes carrots and red potatoes in analysis.